cir·cle - /ˈsərkəl/ - A round plane figure whose boundary (the circumference) consists of points equidistant from a fixed center. fifth - /'fith/ - A tone on the fifth degree from another tone (counted as the first). When the term 'fifth' is used in music it is usually referring to a perfect fifth. A perfect fifth is five staff positions up or down from any other note including the starting note. A D up to an A, an E to a B, and an F to a C are all perfect fifths. We need to get a little more specific and say that a perfect fifth is seven semitones, or half-steps away. We say this because a perfect fifth up from B is not an F, but instead an F#. Sometimes a perfect fourth (five semitones/half-steps away) is used instead of fifth. Starting on any note. A fourth can easily replace a fifth because a fourth down, and a fifth up (or vise versa) will land on the same note. The top of the circle is a C. You can usually think of C as the middle of most everything in music. C is the top of the circle of fifths, C is the note directly between bass and treble clef, C is on the middle line in alto clef, and much more. This letter refers to the key of C major. As you move clockwise around the circle each letter moves up by a perfect fifth, and one sharp is added to the key signature. G major has one sharp, D major has two, etc. If we move counter clockwise around the circle starting at the top each letter moves down a perfect fifth, and one flat is added. F major has one flat, B-flat major has two, etc. There can only be a total of seven sharps, or flats in a key signature. At the bottom they overlap. Since G-flat major, and F# major have the same pitches, and are just enharmonic (different names for the same pitch) spellings of each other they are on the same spot. The smaller circle on the inside represents the minor key signatures. The relative minor of C is A, so they are both on the top. 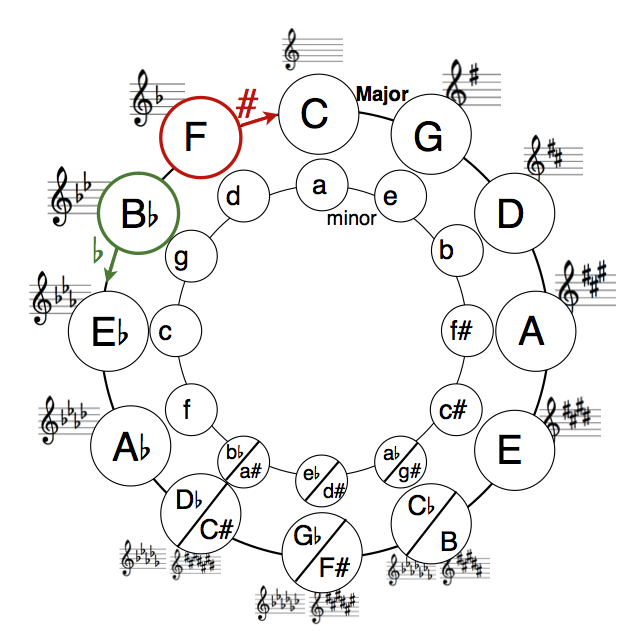 Just like the outside circle, the minor key signatures change by going up, or down a perfect fifth (A - E - B - F#). The order of sharps, and flats will always be the same when looking at key signatures. If you have one sharp it will always be an F. If you have three sharps it will always be F-C-G. The order of sharps, and flats is also presented on the circle of fifths. If you start on the major key of F, or 11 o'clock, and move clockwise you will go through the order of sharps (F - C - G - D - A - E - B). Starting on the major key of B-flat, or 10 o'clock, and moving counter clockwise will give you the order of flats (B - E - A - D - G - C - F). There are many ways other ways of seeing the order of sharps, and flats in the circle of fifths. A different way to figure out the order of flats is that the order of sharps is the order of flats just in reverse. The circle of fifths is also a guide to finding basic chord progressions. The majority of Western tonal music ends the same way. There is usually a type of five chord, followed by a one chord (moving counter-clockwise). This is usually written in roman numerals as V - I. If you are performing a piece of music in the key of C major the ending will likely have a G chord (V) followed by a C chord (I). A piece in D minor will likely end A chord - D chord (V - I). If you move clockwise around the circle going from a G to a D, you would be going from a four chord to a one chord (IV-I). This type of chord progression is often used at the end of sacred music. There are many variation, and exceptions to the chord progression guide, but it lays the ground work for more advanced progressions, and modulations. Memorizing the circle of fifths can seem like a difficult task, and having to count seven semitones for each note is even harder. Luckily string players have an easy cheat sheet right at their finger tips. Our strings are a perfect fifth apart! Bass strings are a perfect fourth, but as discussed earlier, if you just reverse the steps a perfect fourth, and perfect fifth will be the same note. If you start on any C on the instrument, and move up to a higher string (lower for bass) you will go directly to the fifth above it, and the next letter in the circle of fifth. Up a string from a C will take you to a G, up from G will take you to D, and so on. You can see visually with the red arrows going clockwise around the circle, and with the blue arrows going counter clockwise. Starting on a C and moving down a string (up for bass) you will be moving down a perfect fifth. C will take you to an F, F to B-flat, B-flat to E-flat. Soon you run out of strings, but you can still go to any note on the instrument, and do the same technique to find the next note in the circle. A perfect fifth is is neither major nor minor because is applies to both scales, and chords. Two notes that are a fifth apart should sound as if they fit together. This is because the vibrations are at a 3:2 ratio. If an A is 440hz, an E a perfect fifth up will be 660hz. Because of this, the notes seem to fall perfectly into one another. Please feel free to download printable filled in, and blank (for class work, or fantastic coloring pages!) circle of fifths in the downloads section!